Review by AllTheBestFights.com: 2015-06-27, fight not particularly exciting between Hacran Dias and Levan Makashvili: it gets two stars. The black belt in Brazilian jiu-jitsu Hacran Dias entered this fight with a pro mma record of 22-3-1 (55% finishing rate) and he is ranked as the No.19 featherweight in the world. He lost two consecutive bouts between 2013 and 2014, against Nik Lentz and Ricardo Lamas (=Lamas vs Dias), but then he came back to win beating Darren Elkins. His opponent, Levan Makashvili, has an official record of 7-1-0 (43% ko/tko victory rate – he has never won via submission) and he entered as the No.45 in the same weight class. He suffered his only defeat in 2014 when he faced Alexandre Bezerra but after this fight he took revenge on the Brazilian and won over Mark Eddiva at his Ufc debut (=Makashvili vs Eddiva). 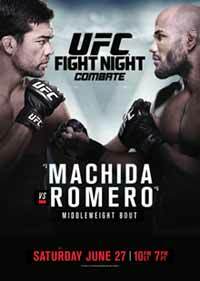 Dias vs Makashvili is on the undercard of Lyoto Machida vs Yoel Romero – UFC Fight Night 70. Watch the video and rate this fight!